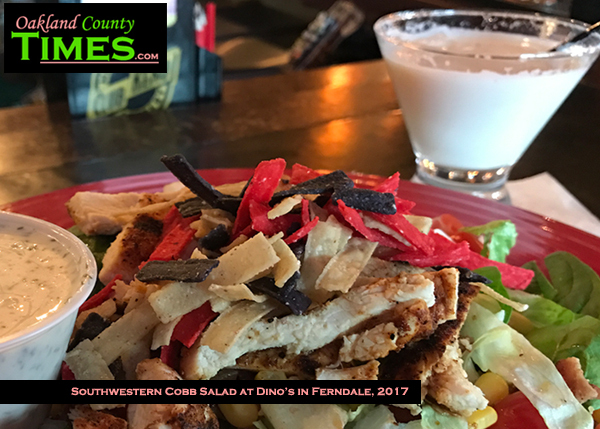 Ferndale, MI – Dino’s Lounge in Ferndale has been one of our longest supporters and the corner spot at the end of the bar is one of the best “offices” to get work done. 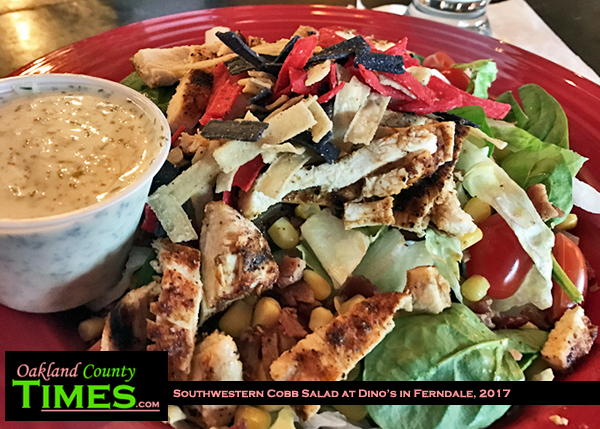 Among their tasty meal options is the Southwest Cobb Salad, which has Blackened chicken breast, mixed greens, bacon, avocado, roasted corn, tomato, and tortilla strips. Normally it is served with Scotty O’Hotty beer bacon chipotle ranch, but I am partial to Dino’s house-made dill ranch personally. I also have taken a liking to their Cinnamon Toast Crunch drink which has Fireball Whiskey (for the cinnamon) and Rum Chata served with ice. It’s almost like having desert, but with fewer calories. Dino’s Lounge is located at 22740 Woodward Ave, Ferndale, MI 48220. Their website is www.dinoslounge.com. Check out other Reporter Food columns from Dino’s by CLICKING HERE. And for Reporter Food columns throughout Oakland County go to http://oaklandcounty115.com/category/food-blogs/.